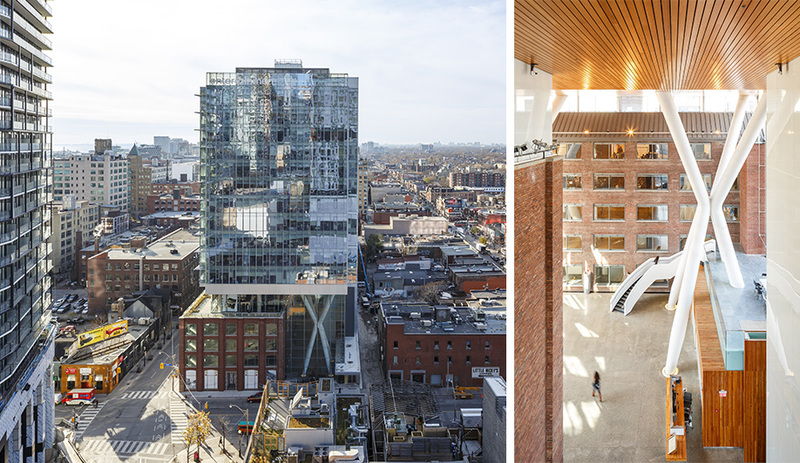 In Toronto, Sweeney&Co's soaring office tower sits above two historic factories. 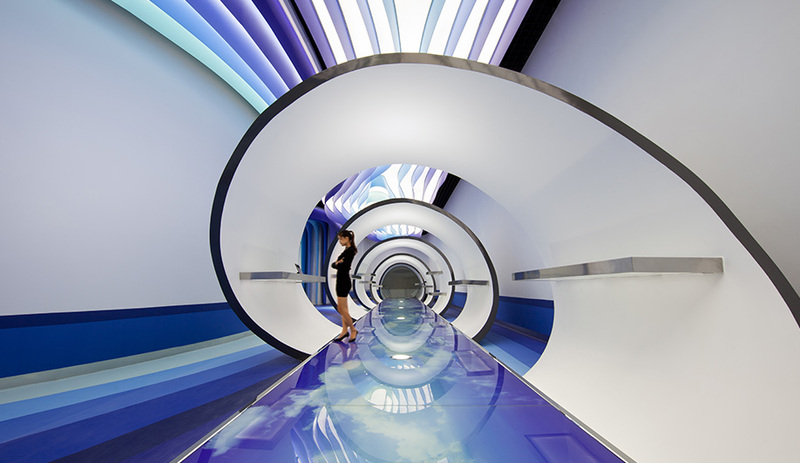 The futuristic environment for a digital communications centre in China. Two bright orange columns anchor the all-white space of La Shed's Montreal office. 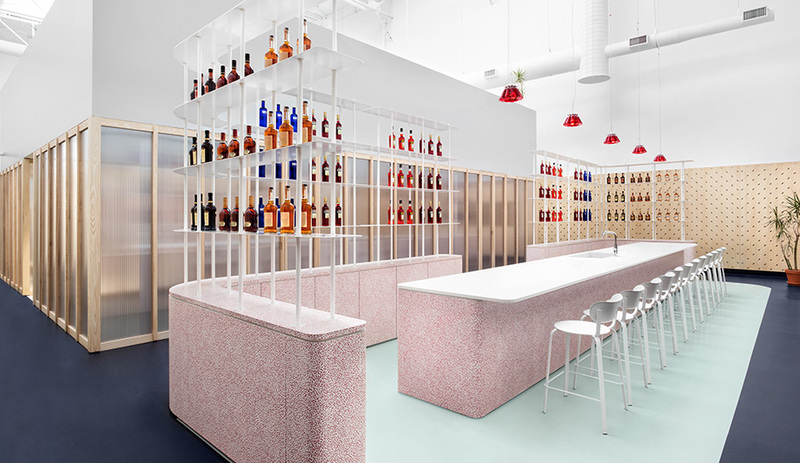 The laminated tasting bar in Campri's Toronto headquarters is clad in a pattern designed by Ettore Sottsass in the 1980s. 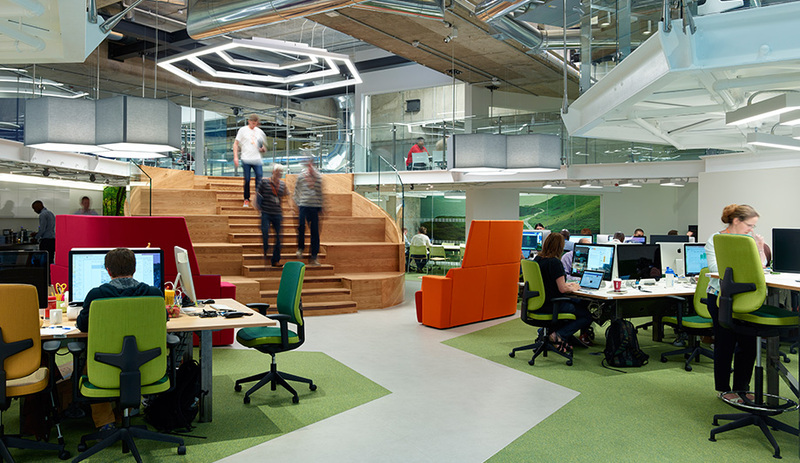 London grocery chain Sainsbury's Digital Lab, an underground creative hive. 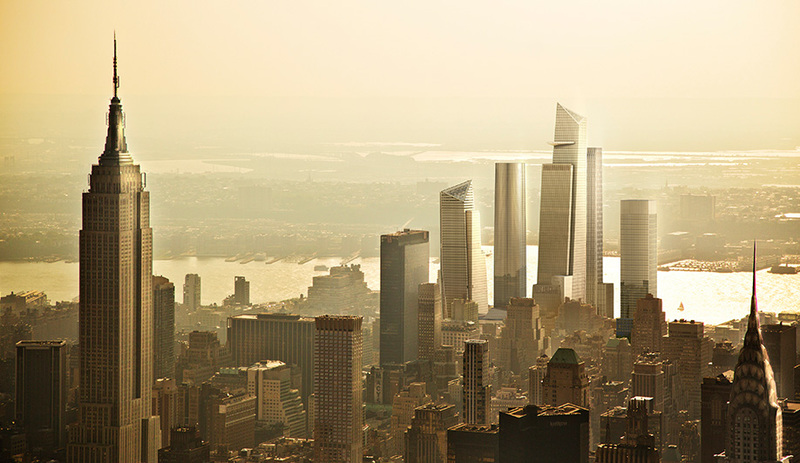 An ariel view rendering of New York's changing cityscape. 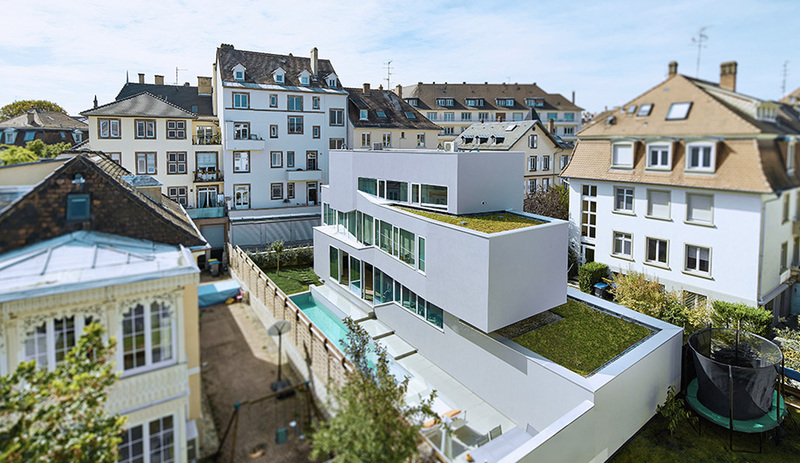 Architect Marc Fornes stacked three volumes slightly askew for a family home in France. 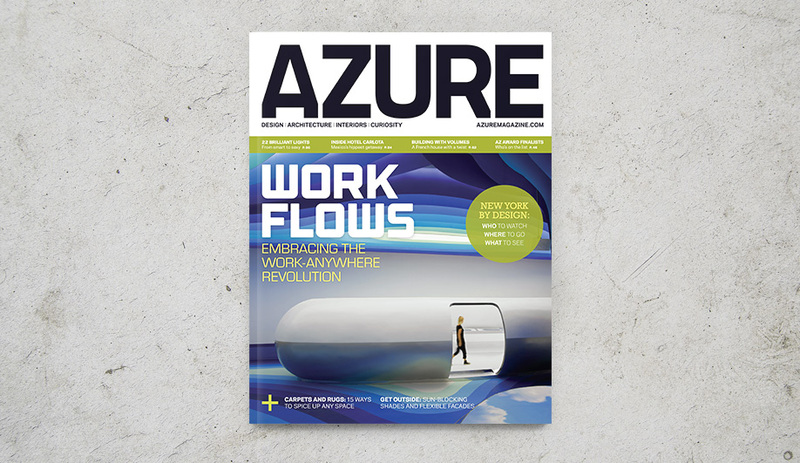 The June 2016 issue of Azure features four stunning offices at the forefront of a new approach to working. Plus, our list of top 10 must-see summer events in New York, a bold Toronto office tower that rises above two historic warehouses, the latest in lighting, and more. 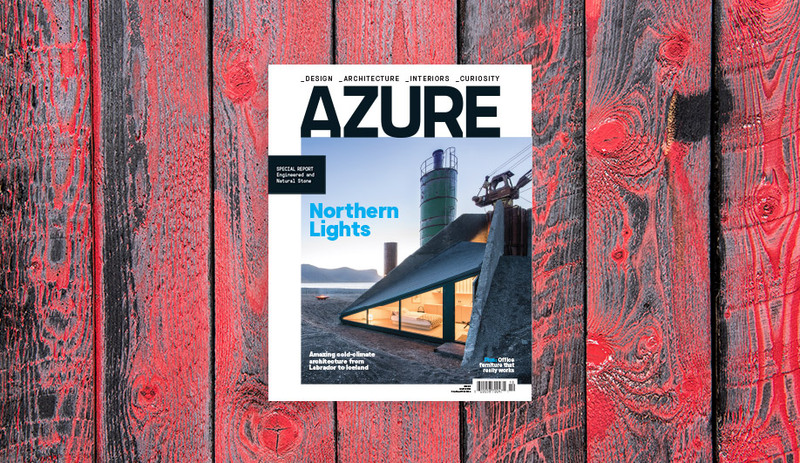 On newsstands now, our office issue highlights four spaces that are embracing the work-anywhere revolution: Montreal architecture firm La Shed turns a centuries-old general store into its own gleaming all-white think tank; in London, U.K., grocery chain Sainsbury’s creates a dynamic environment that encourages flexible activity-based working; Campari sets up shop in Toronto, with a pink-imbued headquarters; and in China, a digital communications company reconfigures an industrial park into a futuristic and immersive centre. Visiting New York City this summer? We’ve put together a top 10 list of must-see events and attractions happening throughout the city, from quirky art installations to West 8’s transformation of Governors Island into a rambling public playground complete with four super-slides. Also: Our favourite lamps seen at Frankfurt’s largest lighting expo, from decorative indoor pendants to slender outdoor light poles; in Toronto, local firm Sweeny&CO maintains the history and integrity of two centuries-old brick-and-beam factories by erecting a 11-storey tower above and around them; a vibrant culture-rich hotel in the heart of Mexico City; and innovative and super-durable textiles for facades and roofing. 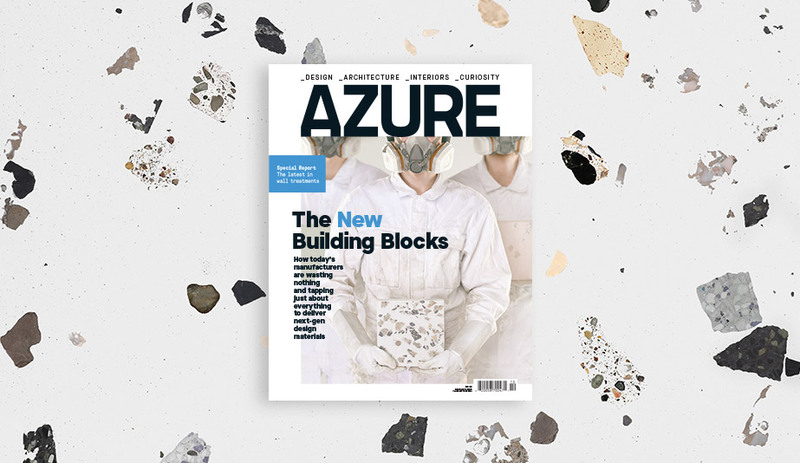 The June 2016 issue is available in Canada, and hits U.S. newsstands on May 23. Get yours now: for single copies go to shop.azuremagazine.com; to subscribe, go to azuremagazine.com/getazure.